What is the difference between Application Context and Web Application Context? I am aware that WebApplicationContext is used for Spring MVC architecture oriented applications? I want to know what is the use of ApplicationContext in MVC applications? And what kind of beans are defined in ApplicationContext? Web Application context extended Application Context which is designed to work with the standard javax.servlet.ServletContext so it's able to communicate with the container. There are many things possible to do with the ServletContext instance, for example accessing WEB-INF resources(xml configs and etc.) by calling the getResourceAsStream() method. Typically all application contexts defined in web.xml in a servlet Spring application are Web Application contexts, this goes both to the root webapp context and the servlet's app context. Also, depending on web application context capabilities may make your application a little harder to test, and you may need to use MockServletContext class for testing. 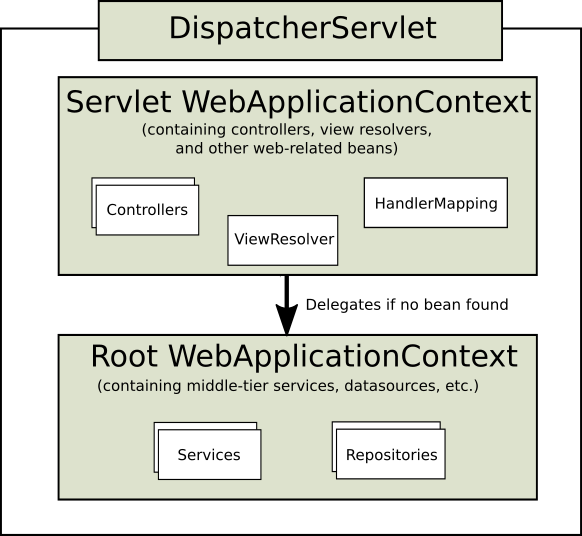 Difference between servlet and root context Spring allows you to build multilevel application context hierarchies, so the required bean will be fetched from the parent context if it's not present in the current application context. In web apps as default there are two hierarchy levels, root and servlet contexts: . This allows you to run some services as the singletons for the entire application (Spring Security beans and basic database access services typically reside here) and another as separated services in the corresponding servlets to avoid name clashes between beans. For example one servlet context will be serving the web pages and another will be implementing a stateless web service. Please note that if init-param will be omitted, then spring will use myservlet-servlet.xml in this example. Going back to Servlet days, web.xml can have only one <context-param>, so only one context object gets created when server loads an application and the data in that context is shared among all resources (Ex: Servlets and JSPs). It is same as having Database driver name in the context, which will not change. In similar way, when we declare contextConfigLocation param in <contex-param> Spring creates one Application Context object. You can have multiple Servlets in an application. For example you might want to handle /secure/* requests in one way and /non-seucre/* in other way. For each of these Servlets you can have a context object, which is a WebApplicationContext. The WebApplicationContext is an extension of the plain ApplicationContext that has some extra features necessary for web applications. It differs from a normal ApplicationContext in that it is capable of resolving themes (see Using themes), and that it knows which Servlet it is associated with (by having a link to the ServletContext). The WebApplicationContext is bound in the ServletContext, and by using static methods on the RequestContextUtils class you can always look up the WebApplicationContext if you need access to it. ApplicationContext (Root Application Context) : Every Spring MVC web application has an applicationContext.xml file which is configured as the root of context configuration. Spring loads this file and creates an applicationContext for the entire application. This file is loaded by the ContextLoaderListener which is configured as a context param in web.xml file. And there will be only one applicationContext per web application. WebApplicationContext : WebApplicationContext is a web aware application context i.e. it has servlet context information. A single web application can have multiple WebApplicationContext and each Dispatcher servlet (which is the front controller of Spring MVC architecture) is associated with a WebApplicationContext. The webApplicationContext configuration file *-servlet.xml is specific to a DispatcherServlet. And since a web application can have more than one dispatcher servlet configured to serve multiple requests, there can be more than one webApplicationContext file per web application. Not the answer you're looking for? Browse other questions tagged spring spring-mvc applicationcontext or ask your own question. How to call a method after bean initialization is complete? Using ApplicationContext in Spring MVC. What is difference between ApplicationContext and WebApplicationContext?